Danai Gurira was a presenter yesterday evening(March 30th) at the 50th NAACP Image Awards at the Dolby Theatre in Hollywood, California. It's been a minute since I have seen Danai wearing ROSIE ASSOULIN on the carpet and she looked beautiful wearing a gown from the fashion house FALL 2019 COLLECTION. 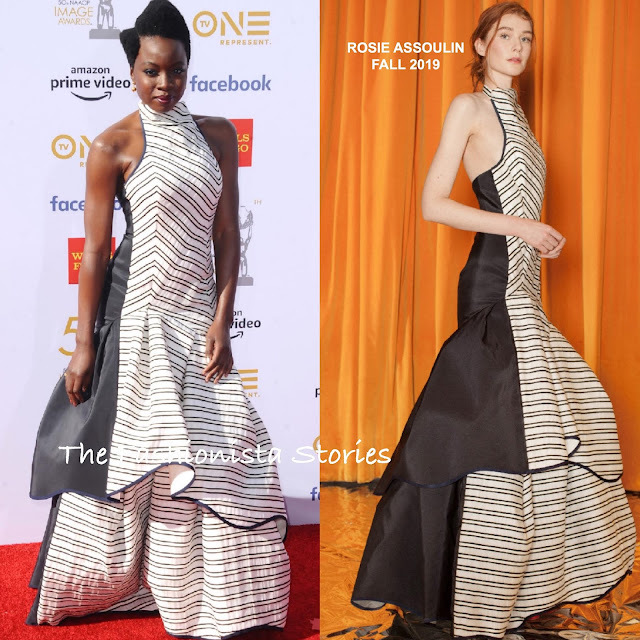 She wore the 'Rosie's Flower' black & white stripe panel, halter gown, featuring an asymmetrical ruffle hem. SOPHIE BUHAI jewelry, ROGER VIVIER heels and a flawless beauty look rounded out her look.